Company H, 1st Missouri Light Artillery, “Welker’s Provost” « The Turner Brigade--Missouri Volunteers, U.S.
Members of Company H, 1st Missouri Light Artillery, “Welker’s Provost”, by a Parrott rifle. 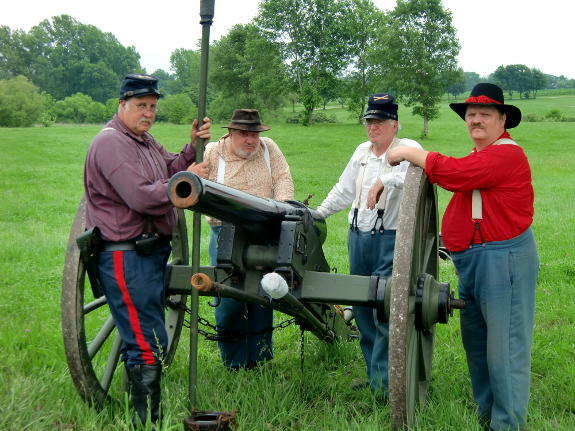 The reenactors of Company H, 1st Missouri Light Artillery, “Welker’s Provost”, represent the Civil War equivalent of the military police. The Provost Guard (pronounced “proh-voh” in military usage) reported directly to the Provost Marshal of a division or corps in the field or of a military district where an area was under martial law, as were many areas of Missouri. In the field, they were charged with headquarters security, straggler and deserter roundup, and prisoner guard. In occupied areas, they served as law enforcement officers for the civilian population. Captain Frederick Welker was the captain of Company H, 1st Missouri Light Artillery, from September 26, 1861, to November 3, 1864, when he was promoted to Major. For an official history of the various units of the 1st Missouri Light Artillery during the War of the Rebellion, read the excerpt of Annual Report of the Adjutant General of Missouri for the Year ending December 31, 1865.